While the media champion the Occupy Wall Street movement as if it's the American version of the Arab Spring, they're predictably missing a crucial distinction. In America, the top 1% earn more than $380,000 per year. We are, however, among the richest nations on Earth. How much do you need to earn to be among the top 1% of the world? That was the finding World Bank economist Branko Milanovic presented in his 2010 book The Haves and the Have-Nots. Going down the distribution ladder may be just as surprising. To be in the top half of the globe, you need to earn just $1,225 a year. For the top 20%, it's $5,000 per year. Enter the top 10% with $12,000 a year. To be included in the top 0.1% requires an annual income of $70,000. 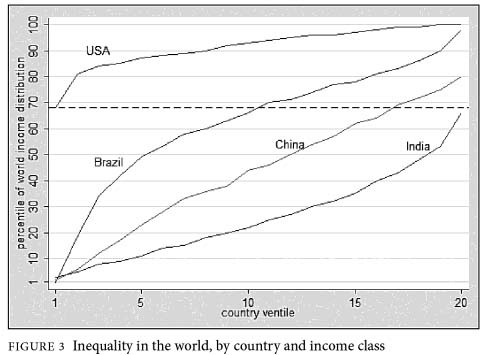 Contrary to the current media meme, when adjusted for international dollars as well as cost and standard of living, there is far greater income inequality in Brazil, China, and India. More importantly as it pertains to the Occupy Wall Street movement, people in the bottom five percent of income here are still richer than 68 percent of the world’s citizens. In short, most of those protesting in the Occupy Wall Street movement would be considered wealthy -- perhaps extraordinarily wealthy -- by much of the world. Many of those protesting the 1% are, ironically, the 1%. Maybe America's media should keep these numbers and images in mind as they cry a river for OWS protesters. After all, according to the rest of the world, these people should be eating each other.